Adi Shri Shankaracharya was the most vibrant Indian saint to ever live. He was the grand sire of Indian philosophical thinking. His achievement in thirty two years was stupendous in the history of Indian philosophy. Adi Shri Shankaracharya was a self-realized sage, a scholar, a caring and loving son, a debator, a compassionate teacher, a revolutionary thinker and he had a charismatic personality. 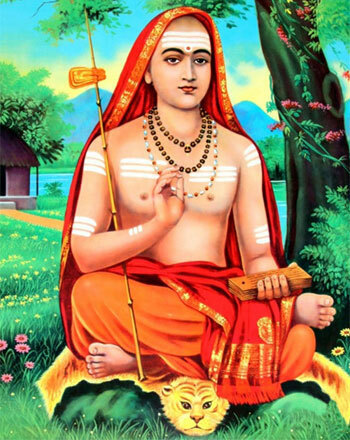 Adi Shri Shankaracharya played an important role in Advaita Vedanta, which is a branch of Indian philosophy. Literally, Advaita means ‘non dual’ or ‘not two’. Advaita says that Brahman is our true nature, Brahman is eternal, unmoving, real. The world is unreal, Brahman alone is real. This is the core of Advaita. Hinduism was on a decline when Shankara arrived on the scene, and due to his efforts he once again established it and set it on a firm ground. He tirelessly travelled across the country from Kerala in the south to Joshimath in the north and from Dwaraka in the west to Puri in the east. His extensive travelling across India united the country by awakening its common spiritual heritage. Adi Shri Shankaracharya was born in 507 B.C. in Kaladi, a village in Kerala. His parents were Sivaguru and Aryamba. They were a pious couple, middle aged prosperous from the NambudirI Brahmin community. As they were childless, Aryamba and Sivaguru performed severe penances to Lord Shiva for a child. Lord Shiva appeared to them in a vision and said that he would incarnate as their first born. Later, in a dream that both of them had, the Lord asked them to choose between an extraordinary son with a short life or a dull son with a long life. Both, independently, chose the former. Shankara was born and very soon he was known as a child prodigy. He could read and write before the age of two. He started his formal education by the age of three at the village school or gurukula. He soon mastered Sanskrit, which was the language of learning and instruction. Shankara completed studying all the four Vedas and the six Vedangas by the age of eight. Having finished his formal education when he was eight years old, he revealed his desire to become a monk. He had to take the permission of his mother, who refused because he was her only son who was meant to take care of her. Shankara did not give up hope. One day while he was bathing in the Puma River, a crocodile caught his foot. His mother tried getting help from others to save her son, but to no avail. Shankara called: “Mother, it looks as if my end has come. Will you fulfil my last wish of becoming a sanyasi? Please grant me permission”. His mother agreed and at that moment a miracle took place. The crocodile disappeared after leaving his leg. Then Shankara reminded his mother of her promise and immediately left, donning the saffron robes of a sanyasi. He promised his mother that he would come at the time of her death to perform her last rites. Reaching his mother’s bedside at the time of her death he did impart to her the knowledge of the highest, and she died peacefully, an enlightened soul. In spite of knowing that once he became a sanyasi he should not perform her last rites, he still performed them and was ostracized by the orthodox Nambudiri community, as they did not approve of a sanyasi performing the rites of a householder.He cremated the body in his garden; the orthodox community repented and till today the Nambudiris, unlike other Hindus, cremate their dead in their backyards. He soon went in search of a Guru who would initiate him into sanyasa. The great Rishi Govindapada lived in a cave “GOVIND VANAM” on the banks of the river Narmada, near the famous pilgrimage Sakal Ghat. Govindapadacharya was a disciple of Gaudapadacharya. His main teaching was on Advaita or non duality. Shankara went there and saw that the great Mahatma was deeply immersed in meditation, and there were many people who wanted to pay their respects to him. As Shankara entered the cave, he sang in praise of his Guru. The Mahatma came out of samadhi and asked Shankara who he was, to which Shankara replied that he was ‘the Self. Govindapadacharya was very happy to see Shankara as a fully realized soul, and he initiated him into “DANDA SANYASA”. Shankara stayed with him for three years and mastered all scriptures. Govindapada asked him to write a commentary on the Brahmasutras and then asked him to go to Kashi (presently known as Varanasi) and pray to Lord Vishwanatha. Guru Govindapada went into meditation and attained mahasamadhi. Shankara went on his long journey to Badarikashrama. On his way, at one spot he saw a ray of light. Shankara later established “JYOTHIRMATH” at this spot, which is known as Joshimath presently. Shankara stayed with his disciples at Badrikashrama for four years and completed writing commentaries on Srimad Bhagavad Gita, the Brahmasutras and the Upanishads. The commentaries on the Brahmasutras are his most important work. He then went to Kedarnatha. Now, it was the end of his destined life of sixteen years but Rishi Veda Vyasa granted him another sixteen years to fulfill his mission. 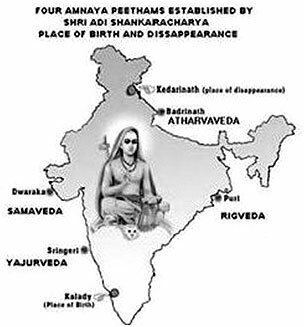 Shankara travelled by foot the length and breadth of the country along with a few of his disciples. His only belongings were his saffron robe, khadau or wooden sandals, kamandalu or begging bowl, and Brahmadanda or walking stick. Shankara along with his disciples visited many holy places like Mathura, Vrindavan and Indraprastha. In Prayag he met Kumarila Bhatta who had studied Purva Mimamsa. Kumarila Bhatta wanted to learn the philosophy of Buddhism, and so he disguised as a monk and enrolled as a disciple to master Buddhism. Later when his guru came to know about his disguise, he had to leave with a feeling of guilt as he had betrayed his gurus trust. He wanted to burn himself in repentance. Just then Shankara arrived on the scene and Kumarila Bhatta asked him to chant the ‘Taraka Mantra’, as the sound of thiss mantra would help him to gain liberation. He also asked Shankara to meet his disciple Mandana Mishra. Shankara travelled to Mandana Mishra’s abode, but Mishra was not to happy to see him. Shankara remained unperturbed and said that his guru Kumarila had sent him, and he wanted him to discourse on the eternal truth. As it was his guru’s wish, Mandana agreed to debate with Shankara; if he lost he would embrace Advaita and take up sanyasa. Mandana’s wife Ubhaya Bharati was the referee; she placed a garland around their necks before they commenced. She asked them to begin the debate. She declared that he whose garland flowers would fade first would be the loser. The debate lasted for a few days. As Mandana’s garland wilted and faded, he accepted defeat and became the disciple of Shankara. His monastic name was Sureshwaracharya. He became the head of the Dwaraka Sharadhapeetham in Dwaraka. Shankara’s major works are commentaries on the Brahma Sutras, Bhagavad Gita, and the ten main Upanishads. His other works are Vivekachudamani, Aparoksha Anubhuti, Atmabodha,and Stotras like Bhaja Govindam, Kanakadhara Stotram, Dakshinamurthi Stotra, Anandalahari, Dvadasa Panjarika and many more. school for the entire period of his study and practices celibacy. Grihastha: After the completion of his studies around the age of 25, the youth marries and fulfills his duties as a house holder in family and society. Vanaprastha: Detaching from worldly ties and spending more time reading scriptures, meditation, visiting places of pilgri mage. Sanyasa: Cutting off all ties with the world, the sanyasi roams without any attachments. 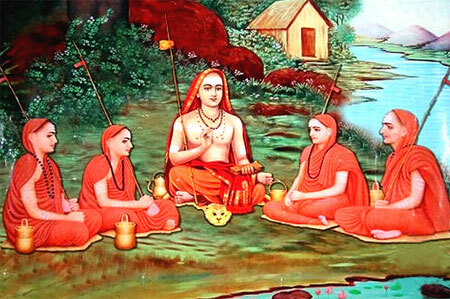 Shankara travelled extensively throughout the country and established the four mathas or monastic centres of spiritual education, whose leaders in apostolic succession bear the title of’Jagadguru Shri Shankaracharya’. Jagadguru here means ‘world teacher’. ‘Swami’ is a term given to a person of this ancient monastic order. The word Swami means in Sanskrit ‘he who is one with the Self. A Swami takes vows of celibacy and renounces worldly ties; he devotes all his time to the service of humanity, spiritual practices, meditation and also in giving discourses on the scriptures. There are ten titles as given to his disciples in this monastic order, which are Vana, Aranya, Parvata, Sagara, Giri, Puri, Bharati, Tirtha, Ashrama and Saraswati. Sureshwaracharya was the first acharya appointed by Shankara. The brahmacharis and sanyasis of this centre study the Sama Veda, and they meditate on the mahavakya ‘Tat Tvam Asi’, which means ‘You are that’. The present acharya is His Holiness Swami Swaroopananda Saraswati, who is 78th in the lineage of Shankara. Padmapada was its first acharya. Their major studies are on Rig veda . Veda, and they meditate on the mahavakya ‘Prajyanam Brahma , which means ‘Brahman is pure consciousness’. The present acharya is His Holiness Swami Nischalanand Saraswati, who is 145th in the lineage of Shankara. Totakacharya was its first acharya. The brahmacharis and sanyasis of this centre study the Atharva Veda, and they meditate on the mahavakya ‘Ayam Atma Brahma’, which means ‘This atman is Brahman’. The present acharya is His Holiness Swami Swaroopananda Saraswati, who is 45th in the lineage of Shankara. He is also the Shri Shankaracharya of Dwarka Shardapeetham. In the lineage of Adi Shri Shankaracharya, His Holiness is the only Jagadguru Shri Shankaracharya to have occupied two seats. Hastamalaka was its first acharya. Their major studies are on theYajur Veda and they meditate on the mahavakya ‘Aham Brahmasmi’ which means ‘I am Brahman’. The present acharya is His Holiness Swami Bharati Tirtha, who is 36th in the lineage of Shankara. The philosophy of Shankara states that Brahman is the highest transcendental truth. It is perfect and the only truth. Brahman is the knowledge, the knower and the known. Brahman is the essence of all things. It is the only ultimate existence. It is unconditional and self-illumined. Hence it is non dual, has no attributes and is unconditional. ephemeral objects is a necessary pre requisite for this study. Vairagya – Detachment from sensory pleasures, dispassion, non-attachment. Sama – Calmness, control of the mind. Dama – Control of the sense organs. Uparati – Cessation of activities. Titiksha – Forbearance, means the practice of bearing hot and cold, etc. Samadhana – Samadhana means samadhi or one- pointedness of the mind, keeping the intellect (buddhi) pure and stable and fixed in Brahman. Sraddha – Faith in the scriptures and complete surrender to your guru or spiritual master. Mumuksutva – The urge to attain liberation, the last though by no means the least condition for the sadhaka of Vedanta, is a strong determination for the attainment of liberation and a burning desire for it. At the age of thirty-two, Shankara took Mahasamadhi in the Himalayas near Kedarnath in 465 B.C. “Brahman, the absolute, alone is real; this world is unreal (maya) and the jiva or the individual soul is not different from Brahman”.